I am a culinary student at the Mount Saint Vincent University, Halifax. Canada.(www.msvu.ca). I found your blog very interesting, and was wondering if you have articles/websites/links where I can learn the concept of food costing right from making the standard recipe to how portion sizes are determined and prices fixed. I have tried many websites but they always fall short of providing the complete info. Your help will be greatly appreciated. Warm Regards. " My father was an Air Force Cook during the Korean War. He worked in a large mess hall with over 5,000 airmen and in the Officer's Club. The Air Force issued a great cookbook with hundreds of recipes. All the recipes were designed to yield 100 portions. During my college years, I used the Air Force cookbook to help me with two small businesses. I ran a non-profit board plan for 12 students during the school year. The book helped me develop menu plans and shopping lists. I divided all the ingredient amounts by 6. We also had a clam bake operation during the summer. The recipes for chowder, cocktail sauce and salad dressings were used at each event. Today, you can get a great substitute for the military cookbook. 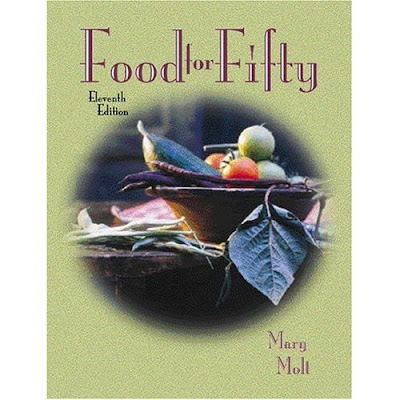 Go on Amazon and order Food for Fifty (12th Edition) . basic techniques. The chapters are laid out by category (i.e. Meat, Fish, etc.) and there are lots of recipes for 50 portions. Throughout the book, there are tables on cooking temperatures, pan equivalents, ingredient substitution and other useful recipe data. The notion of standard pricing is actually a complex subject. If you cost out a standard recipe using today's cost, the actual recipe cost will constantly change with market conditions. There are three schools of thought on standard prices: today's price method, market-based standards and CPI-based standards. The best place to start is today's price method. Eventually, you can start to study market prices and develop more sophisticated standard prices. IDA. Thanks for the comment.